The city of Nazareth  a town of 65,000 residents, bearing the weight of more than 2,000 years of history  sits at the southern end of Galilee, at the bottom of a sloping bowl formed out of a chalky mountain range that overlooks the Jezreel Valley. Not far from Nazareth's Byzantine-era ruins and the sites where Jesus is said to have once trod, you come upon something less historic: a dense, rubble-strewn industrial zone. For the past eight years, this improbable location has been the setting for New Generation Technologies, or NGT, an Israeli incubator that houses 18 early-stage start-ups, mostly in biotech. In the warren of tiny laboratories and offices, Metallo-Therapy is developing a new method for the early diagnosis and treatment of cancer, Rad Dental is working on a device to fight tooth and gum diseases with an electronic clicker, and Lotsam BioPharmaceuticals is testing a novel class of protein therapies to prevent and treat drug-resistant bacterial infections. While a venture called VPSign is creating a solution (an electronic signature) to remove the final obstacle to a truly paperless office, another outfit, Renopharm, has five U.S. patents for its strategies to treat endothelial dysfunction (disorders of the lining of the blood vessels). NGT is the first and only joint Arab-Israeli incubator in the country  and the only one established specifically to target the country's Arab entrepreneurs. Israel's tech-incubator program was hatched in the 1990s as a way to absorb and support immigrants from the former Soviet Union. Since 1991, some 2,000 start-ups have spun out of it, making it one of the pillars of Israel's tech industry. But the country's 1.4 million Arab citizens have found themselves on the sidelines. Being exempt from military service, which is compulsory for Jews, has cut Arabs off from the considerable experience and networking that have been critical to building the country's tech sector, since much of it has grown out of Israel's defense industry. 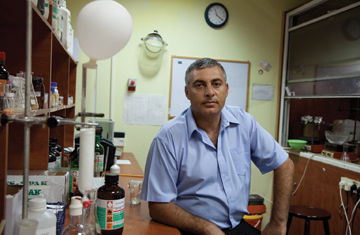 A group of Arab-Israeli businesspeople living in Galilee, largely with backgrounds in agriculture and construction, thought they could leverage the existing incubator model to spur entrepreneurs in the country's Arab population. Looking back, Tamim Yasin, the chairman and president of Obec Gas, a gas-delivery company and one of NGT's founders, says there was "almost a total disconnection between Arab and Jewish communities"  a situation, he says, that had "potential future implications that I didn't like." Indeed, NGT was formed with a triple bottom line in mind. While its main goal is to translate ideas into profitable companies, it was also established as a vehicle to integrate Israel's sizable Arab minority into the nation's economy while promoting co-existence between Jews and Arabs. This idea that business can move the ball when politics can't is one that has quietly been gaining currency. Israeli industrialist Stef Wertheimer, who sold an 80% stake in his company Iscar to Warren Buffett for $4 billion in 2006, has long championed the idea. More important, he has demonstrated that creating jobs and economic prosperity can do much to defuse conflicts. For the past 28 years, his five industrial parks in Israel  home to 73 companies that generate sales of $700 million and employ more than 2,000 people  and one in Turkey have helped entrepreneurs in low-income, high-unemployment regions develop businesses for export. In Nazareth in early July, Wertheimer broke ground on the seventh industrial park that he is financing, which is expected to house up to 25 export-oriented enterprises and create 500 to 1,000 new jobs in the short term. It all sounds wonderful, right? Well, there are limits. NGT has proved that start-ups can be a uniting force in the Middle East  and that there's no way even the best new business plan can avoid the historical friction. In essence, it becomes an issue that has to be managed.